Dr. Tefera is certified by the American Board of Surgery. He specializes in all aspects of vascular surgery, with special interests in aortic aneurysm treatment with endovascular stent grafts and angioplasty of peripheral arteries including carotid artery, illiac and superficial femoral artery. Dr. Tefera provides a wide range of services including Abdominal Aortic Aneurysm (AAA) Repair – Endovascular, Abdominal Aortic Aneurysm (AAA) Repair – Open, Amputation, Angioplasty With Stent Placement, Carotid Endartecotomy, Carotid Stenting, Compartment Syndrome Treatments, Endovascular Aneurysm Repair (EVAR) with a Fenestrated Endograft Stent, Extended Efforts in Limb Salvage, Thoracic Aortic Aneursym – Endovascular, Thoracic Aortic Aneursym – Open, Thoracic Outlet Syndrome Treatment, Varicose Vein Treatment. 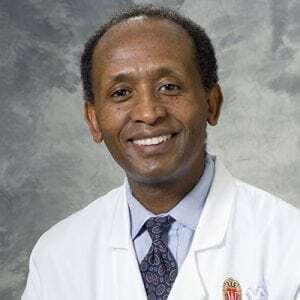 Dr. Tefera has clinical research interests in abdominal aortic aneurysm treatment with endovascular stent graft, distal peripheral artery bypass surgery, and angioplasty and stent for limb salvage. Evaluating the Efficacy of Knowledge-Transfer Interventions on Animal Health Knowledge of Rural Working Equid Owners in Central Ethiopia: A Cluster-Randomized Controlled Trial. American College of Surgeons Member Involvement in Global Surgery: Results from the 2015 Operation Giving Back Survey. Above and beyond: A primer for young surgeons interested in global surgery. Operation Giving Back and the ACS Archives offer opportunities for engagement. Progress in achieving universal access to surgical care: An update and a path forward.